The reign of the Nguyen Dynasty ðŸ‡»ðŸ‡³. The journey from HÃ´i An to Huáº¿ took us about 5 hours but we did stop at numerous locations along the way such as the marble mountain, Háº£i VÃ¢n Pass, LÄƒng CÃ´ beach and the elephant springs to break up the journey. Among all the stops the marble mountain was totally worth a visit with its vast number of temples and caves to explore. The caves have been made into Buddhist shrines where people can go to pray. On a clear day Háº£i VÃ¢n Pass will provide you a panoramic view of the coast, however, on the day we were there it was very hazy and the view was obstructed. LÄƒng CÃ´ beach is a stretch of beach where you can observe local fisher people going about their daily lives. It is also known for its seafood restaurants and white sandy beaches. The Elephant springs consists of a number of natural pools with clear and cool water, surrounded by huge boulders. There are man made structures that are put up during the summer season to provide tourist with some shelter. We were told that the structures have to be taken down before the winter months as the water level increases and the force of the water current becomes too strong. One thing that you can't get away from while travelling through Vietnam is the reminder of war. It's been 42 years since the war ended but there is still evidence of the war around the country. On the way to Huáº¿ you will come across lots of military pillboxes and defensive structures left behind by the Americans as the demilitarised zone is located north of Huáº¿, established as a dividing line between North and South Vietnam. The View from Háº£i VÃ¢n pass. Huáº¿ was the old capital of the Nguyen Dynasty emperors from 1802 to 1945 where the seat of Imperial city is located. In total there were 13 emperors that ruled over Vietnam. The tombs of the emperors can also be found around Huáº¿ and I would recommend that you purchase your tickets for the Imperial city and the tombs of three emperors together as you would get a discount instead of paying for individual tickets. The Imperial city is walkable from Huáº¿ centre however the tombs are harder to get to and transport needs to be arranged by renting a motorcycle, private driver or joining a tour. The Imperial city is vast and I would suggest that you leave at least half a day to explore the city. The Imperial city was built in 1362 and took 203 years to complete- demonstrating a symbol of wealth and power. The imperial city is surrounded by moats and lush greenery. There are 3 defensive walls that surround the Imperial city. Within the Imperial city you will be able to explore beautiful garden, various buildings and the forbidden palace. The forbidden palace is a beautiful building where you will be able to view the seat of the emperor but do take note that photography is not allow inside. The Imperial city was made a UNESCO site in 1993 and originally there were 160 buildings within the imperial city but only about 10 or so remain because of the war. Some of the remaining buildings within the Imperial city are still undergoing substantial repairs and reconstruction. An interesting fact that I've learned is that the Imperial city and all the tombs of emperors faces South. The reason for this is that the Vietnamese were a group of people from the Viet tribe that were actually originally from China, however, the decided to move South away from China's rule and settled where Vietnam is located today. The meaning of Vietnam is taken from "Viet" the name of tribe and "Nam" meaning South. Although there were 13 emperors that ruled over Vietnam till 1945, there are only 7 tombs due to very complicated historical reasons. In Huáº¿ there are only 7 complexes of tombs built by the Court named Gia Long, Minh Mang, Thieu Tri, Tu Duc, Duc Duc, Dong Khanh and Khai Dinh. The construction of each tomb was started during the reign of each emperor as they were preparing for the after life. The three tombs that people tend to visit have unique architecture of different eras and are kept in better condition. The tombs of the emperors were worth a visit as they highlighted the history and ending of the monarchy in Vietnam. If you do have time you could visit all 7 but we were all tomb-ed out after visiting the 3 on a very hot sunny day. The 3 tombs that we visited were: Khai Dinh; Tu Duc and Minh Mang. The tomb of Khai Dinh was built from 1920 to 1931, taking 11 years to complete. This is the tomb of Emperor Khai Dinh, the twelfth emperor of the Nguyen dynasty. During the reign of emperor Khai Dinh, he was very unpopular with the Vietnamese people due to his close collaboration with the French government and was seen as a 'puppet' for the French agenda, by his people. Khai Dinh's tomb is a blend of Western and Eastern architecture as a result of French influences. The tomb of emperor Tu Duc took 3 years to built from 1864-1867. Emperor Tu Duc was the fourth emperor of the Nguyen dynasty and had the longest reign of any monarch, ruling from 1848 - 1843. One interesting fact about emperor Tu Duc was that he had no children even though he had over a hundred wives, he was impotent due to contracting smallpox in his youth. The tomb of Tu Duc was bigger than any other emperor and boasted amenities such as lakes, temples and pavilions. Emperor Tu Duc's primary wife, empress Le Thien Anh's tomb can be found next to his. Within the grounds you will also find the tomb of the third emperor, Kien Phuc who was the adopted son of emperor Tu Duc. However, emperor Kiev Phuket only ruled for seven months before passing away so a separate tomb was not built from him. Emperor Minh Mang was the second emperor of the Nguyen dynasty, he ruled Vietnam from 1820 to 1841. Emperor Minh Mang's tomb is renowned for it's greenery and it's Chinese architectural style. The site contains beautiful monuments, pavilions, temples and bridges. However the tomb of emperor Minh Mang is located on a fenced in hill on the site but its gates are only opened once a year on his death anniversary. 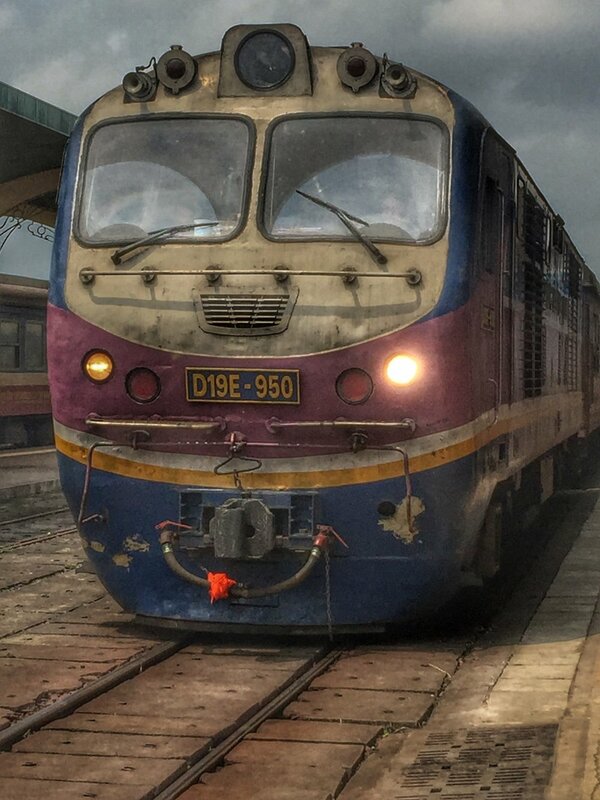 Train from Huáº¿ to Da Nang. BThe thing that we noticed during the visit to Vietnam is that after 42 years of war, the country is slowly but surely recovering from the effects. There seem to more cars on the roads, wireless readily available and the rise of better infrastructures. Vietnam like any developing country will continue to change and progress but I do hope it is done in a way that keeps the rustic feel and charm of the country. To end our trip we needed to head to Da Nang Airport and I highly recommend that, if you have the time, take the train from Huáº¿ to Da Nang. The train seats are comfortable and you are able to purchase food and beverages onboard. The journey will take approximately about 3 hours but you get to sit back relax and enjoy the view of the countryside. In addition it's a lot cheaper that alternative transport.